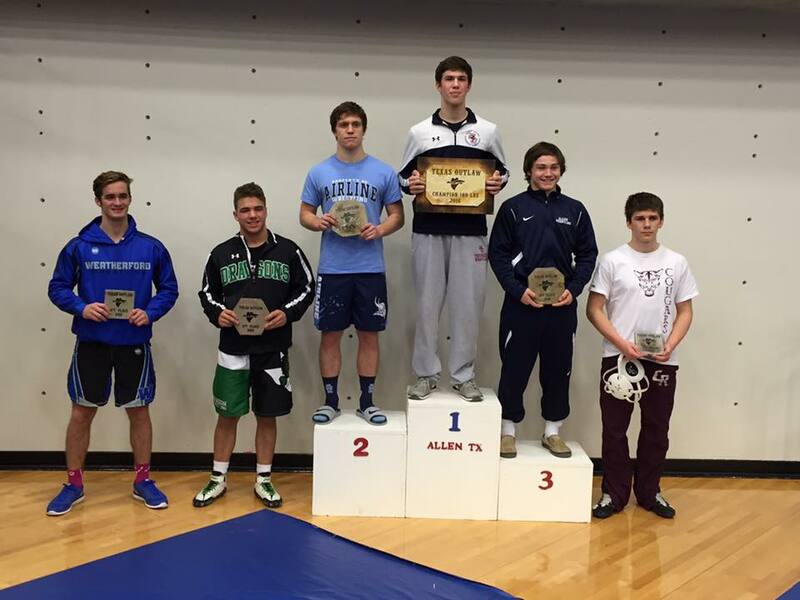 On December 18th-19th Jesuit again entered the Kansas City Stampede. Thirty-eight other teams did as well, including Archer, GA, Allen, TX, Christian Brothers, TN, Platte County, MO, Thompson, AL and Stillwater, OK. The Stampede is not for the lighthearted. 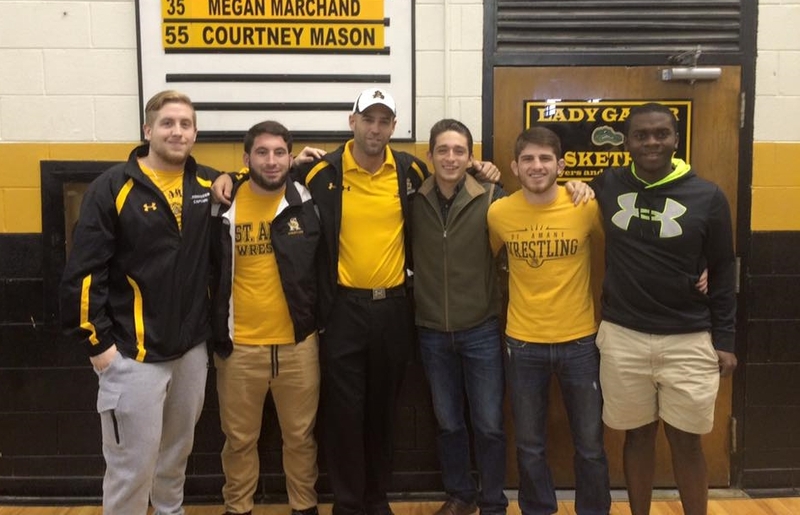 Two Louisiana wrestlers distinguished themselves at the event. Jesuit's Guy Patron, Jr. placed third, although by all accounts should have at least placed second as he did in 2014. A video of his semifinals match clearly showed Patron, Jr. switching his opponent and unquestionably in control for the last second of the match. The two points would have given the Blue Jay a one point victory. Yet inexplicably, and by that meaning the official literally did not explain his decision, the official did not award the points to Patron. Accepting the result in a manner befitting a Jesuit wrestler, Patron shook-off the missed call and proceeded to place third. Joseph Dupre also made it to the "Gold" (championship) bracket and placed a very respectable 11th. Meaning no disrespect to Mr. Dupre, the other Louisiana wrestler who really distinguished himself was former Brusly two-time Division III state champion (and Louisiana Classic, Ken Cole, Greater Baton Rouge, South Walton Border Wars champion - the list goes on and on) Kendon Kayser. Currently a junior at Stillwater High School in Stillwater, OK, Kayser placed second in the event. For unknown reasons the event was not covered on TrackWrestling and hence brackets were not available for review. 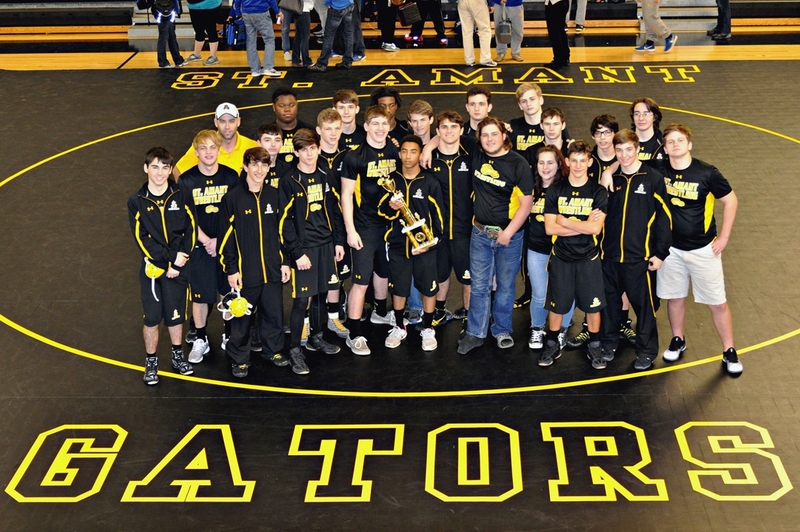 The St. Amant Gators averaged over 65 points per match in winning the 2016 St. Amant Duals, held at the Gold Dome in Gonzales on Saturday. The Gators defeated the Live Oak Eagles 48-25 in the final match of the day. 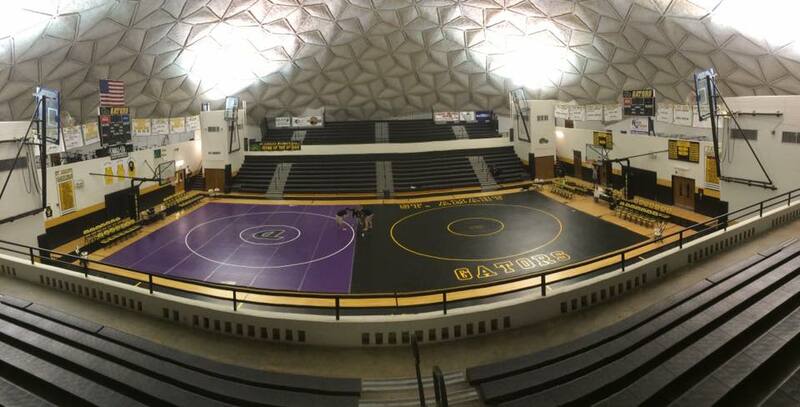 Undefeated for the Gators (minimum of three matches) were Brier Babin, Clint Brownell, Sage Nugent and Cameron Borne. For the Eagles Ethan Alfonso and Brennan Webb were unscathed on the day. Gavin Becker of North Vermillion, John Sinegal and Rodrigo Diaz of Lafayette, Luther Jones of Dutchtown, Landon Wheat and Jordan Campbell of East Ascension and Episcopal's Ellis Herring were also among the undefeated on Saturday. 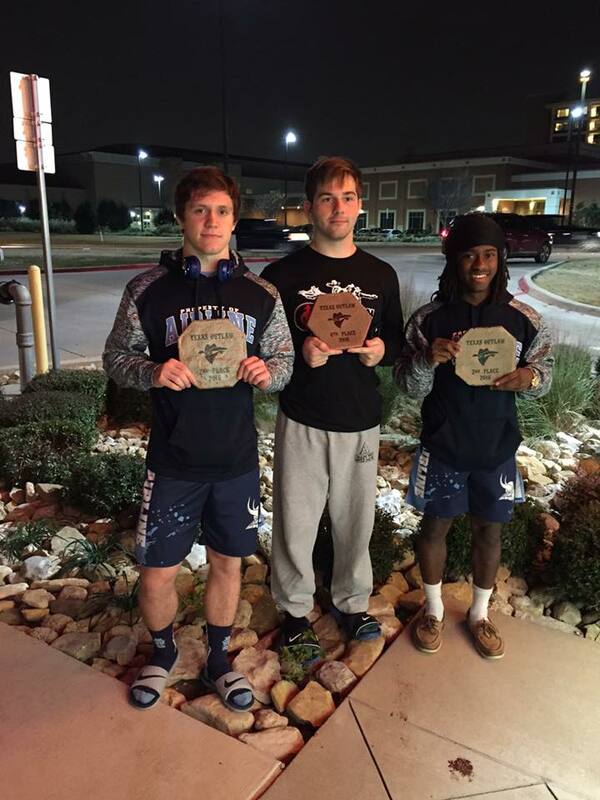 Javarious Jones and Christian Walden placed second, Keegan Gilligan fourth and Joshua Partin seventh in the 28-team Texas Outlaw tournament held at Allen High School in Allen, Texas, last Friday and Saturday. Airline senior Javarious Jones in the #2 spot on the 126 lbs. awards podium. 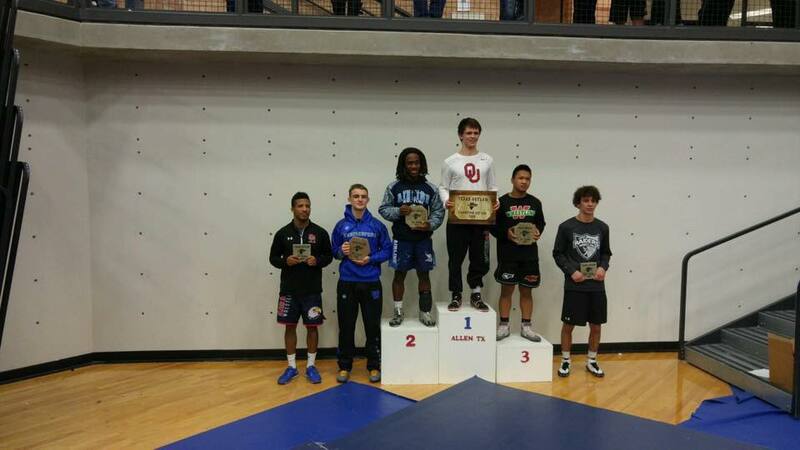 Junior Viking Christian Walden placed as the tournament runner-up at 160 lbs. 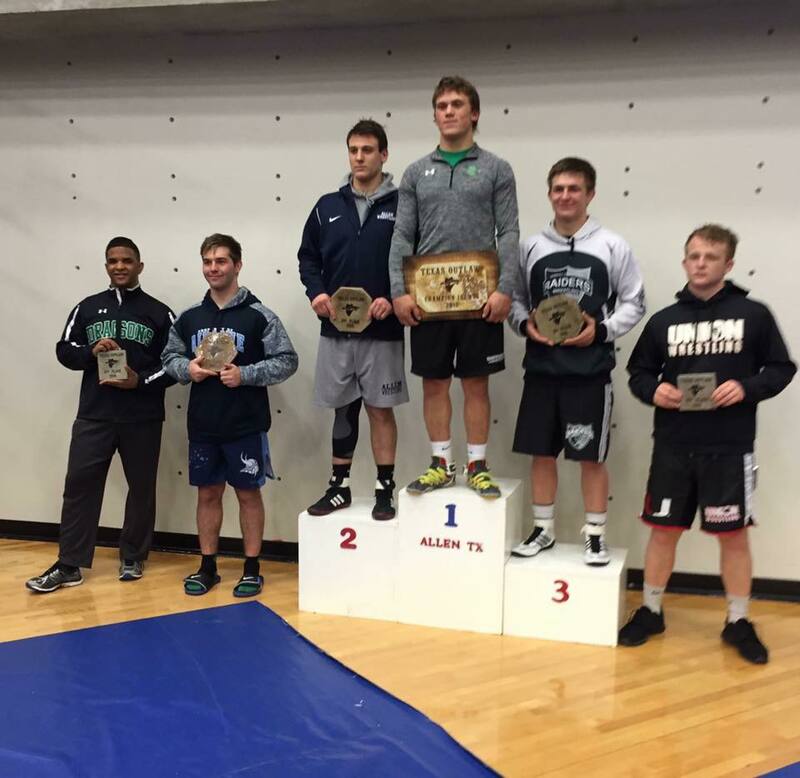 Senior Keegan Gilligan placed fourth at 182 lbs. Gilligan, Walden and Jones with their top-six placement plaques. Jones, the weight class' #2 seed, pinned three of his four pool opponents on Friday and added a 7-3 decision to qualify for Saturday's 126 lbs. eight-man championship bracket. Competition was fierce in this bracket as Jones required a quarterfinal 3-0 score and a 2-1 margin after a first Tie-breaker round to advance to the finals. There he met Westmore, Oklahoma's Dalton Duffield, a 2015 Oklahoma Class 6A state runner-up. Walden was the #1 seed at 160 lbs. and also scored three falls and a decision on Friday. 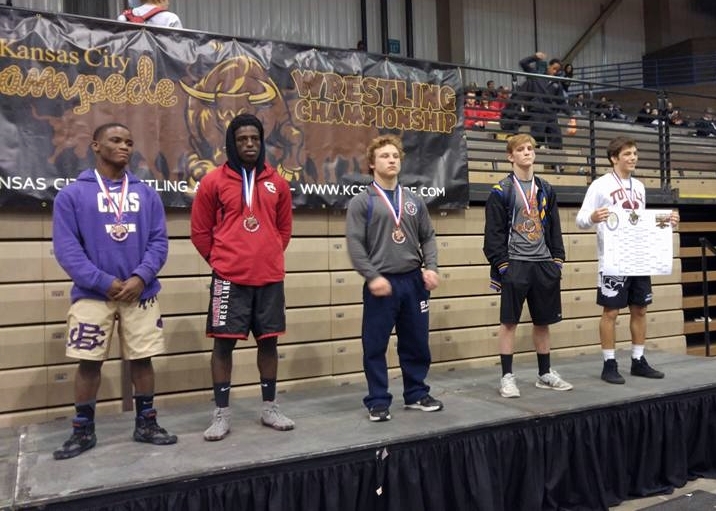 On Saturday he advanced to the finals with falls in 1:12 and 3:02, but was on the wrong end of a 5:05 fall against Sammy Cokeley of St. James Academy in Kansas, who placed 3rd in the 2015 Kansas Class 5A state championships. Gilligan was the #4 seed at 182 lbs. and scored four falls and a 6-0 decision in going 5-0 on Friday. On Saturday he lost via an 11-2 major decision to Christian McBroom of Canyon Randall, Texas, a 2015 Class 5A Texas state runner-up. Gilligan, though, advanced to the consolation finals with falls in 3:10 and 4:57. There he fell to McBroom again, but in a much better 4-3 match. At 132 lbs. Joshua Partin was seeded fourth and won all five of his Friday pool rounds via falls. In Saturday's bracket, however, he dropped his first two matches, via a fall at 3:06 followed by a tight 3-2 loss, which placed him in the match for seventh and eighth place. Partin scored a second period fall in 2:39. Overall Airline placed 12th in the event, which was won by the host Allen, TX "Blue" team.